This is a quick post today. I saw this skirt made from tee’s over at Beelieve and loved the way it looked. Of course mine is a bit different. T-shirts really are great material for a comfy skirt. I made this skirt in about an hour. I just started cutting shirts apart and piecing them together. Next time I will try overlapping more, like Karen from Beelieve did. I even used a long piece from a tee for the drawstring. 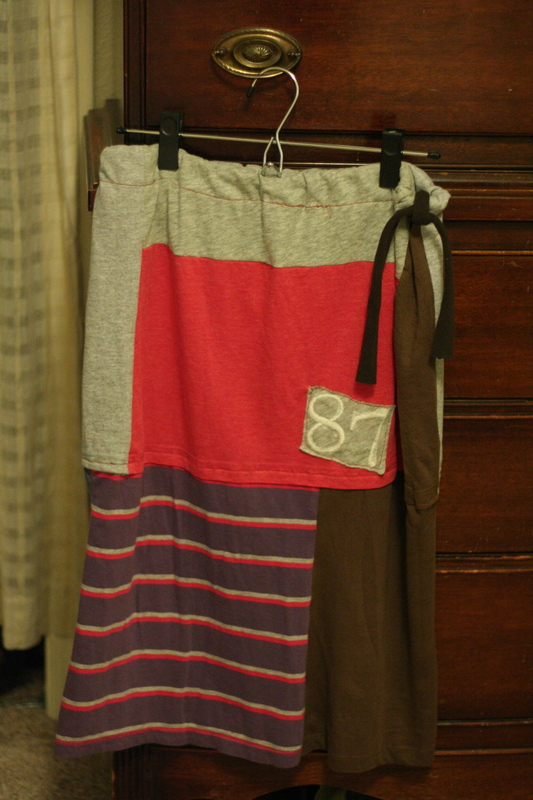 For directions on how to make your own upcycled t-shirt skirt click here. This entry was posted in Check this out!, DIY, Green, I made this!, Recycled, tutorial, upcycle on March 2, 2010 by Deanna. Very Cute!!! I think I’ll give it a try!